Allergies? Heal and seal your gut! So many people with so many allergies. Allergies, sensitivities and intolerances…to foods, to ingredients, to dust, to plants, trees and pollen, to environmental toxins. How about you? So many times moms have come to work with me in my private practice for help crafting a food plan for their child, having just received their food allergy/sensitivity test results for their child. They have come exasperated, feeling desperate. The previous test may have revealed 5 or 6 “trigger foods”…now the number was 30. What were they going to feed their child? How could we craft a diet or menu that was appealing with all of these restrictions? How could we craft a menu that they would eat? Overwhelming! I have even had some clients with more than 120 foods that had been identified as no good. Funny, every time they went for the next test, the number of trigger foods, or those that were not allowed from that point on, increased. It is not that the foods themselves are inherently evil or bad. I have often said that gluten is the current “fall guy”. This week you react to wheat, next week it’s gluten. The next week, gluten and casein…The next week it’s gluten, casein, and eggs. The next week it’s gluten, casein, eggs, chicken, and green beans. Or carrots. Or coconut. Or herring. And so on. And so on. And so on, until you or your child seem to be reacting to just about everything. What is going on? The body, specifically the small intestine, is injured…porous…leaky…and all of the molecules become reactive foods. All allergies can be traced to the state of health of the gut lining. Are you, too, gluten-free? casein-free? wheat-free? dairy-free? Have multiple allergies or sensitivities? Are you tired of it? 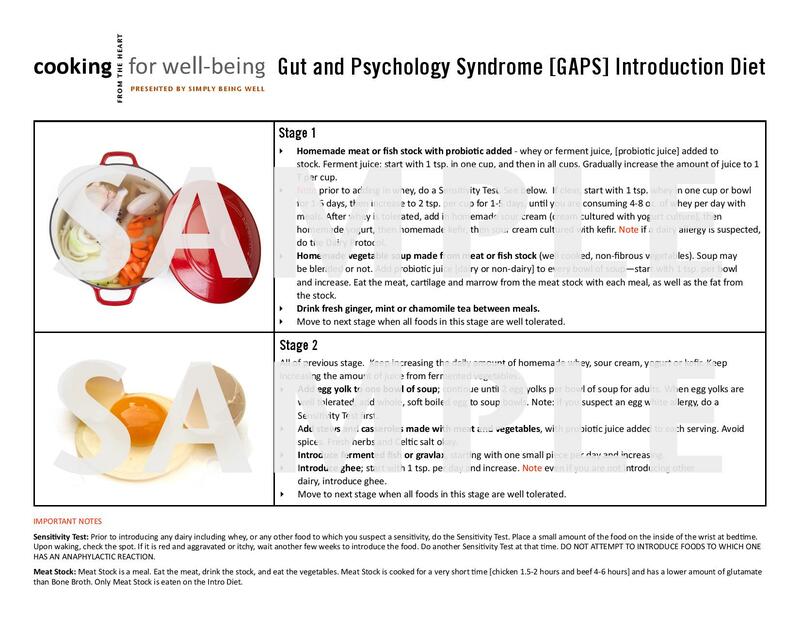 Check out the GAPS diet. I will be teaching a GAPS Cooking Weekend in Silver Spring, MD August 9-10. All the cooking techniques you need to implement the diet with confidence. Dr. Joseph Mercola called these cooking classes “ground-breaking.” More information about that weekend here. The bottom line, folks…heal it and seal it. It all begins with the food.